Little Greta and her parents will never forget their first Kindergarten conference at Byron Primary School. Greta is an outgoing, fun loving five-year-old and was eager and ready for school. 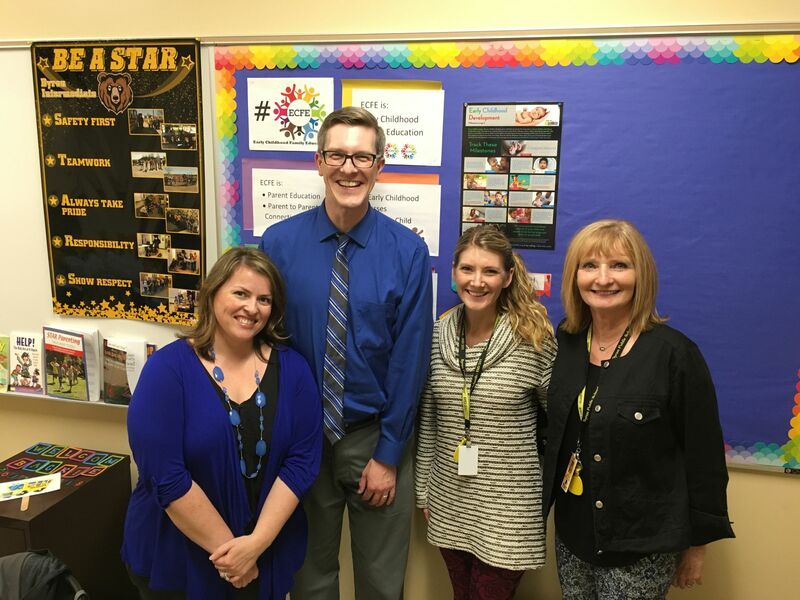 Her teacher greeted her with a warm smile and a hug, while Dr. Joey Page, Superintendent of Byron schools, snapped a photo. This moment was years in the making. Months before Greta was born, her parents were not sure she would have an opportunity to learn in an innovative and high-quality school. Early in the pregnancy, it was determined that their little baby was growth restricted. Without treatment options, her parents anxiously awaited an induction and monitored her health through ultrasounds. She was born full-term, weighing 4 lbs 12 ounces. She struggled in her early days to thrive. Fortunately, Greta did thrive and grow. 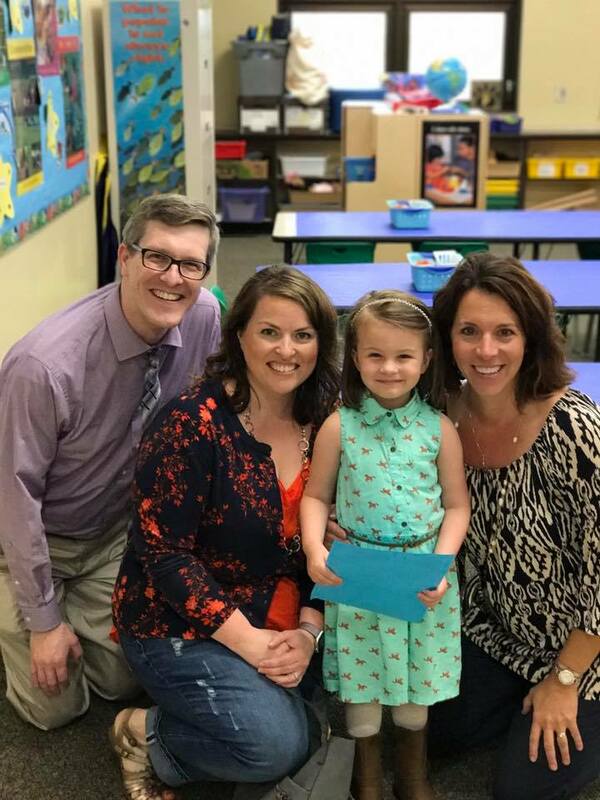 When Greta’s parents were preparing for the transition to kindergarten, they knew it would be important to help her thrive and grow at Byron Public Schools. They participated in the Gearing Up For Kindergarten program through Byron Community Education’s ECFE. Greta was able to visit her new school many times before the first day of school. Even though she is a very outgoing, a new environment can be intimidating to young children. She met teachers and future classmates in the program. Her parents met other parents and learned ways in which they could help her get ready for kindergarten. The connections she and her parents made at the program, helped create a sense of belonging in a new school! With the help of the Byron Community foundation sponsors, we were able to give a donation of $1000 to the Gearing Up for Kindergarten program. Our goal is to be able to provide more than the past donations we have given. Without the help of the community, hosting and continuing to develop these programs for our young children, would not be possible. Can we together make sure these programs continue for children like Greta and other children? Can we help them lay the foundation for a positive school experience to thrive and grow? January 2017 - Byron Community Foundation receives grant for Team R.E.D. Byron Community Foundation is pleased to announce a $10,000 grant from Southern Minnesota Initiative Foundation (SMIF) through a special 30th Anniversary Community Collaboration grant round. This grant will be used to/go to Team R.E.D. for a project that creates a title for Byron, MN as “ The Most Fit City” in Minnesota. The title will be earned by building upon our existing assets and collaboration with other organizations. With these funds, Team R.E.D through our sponsoring agent, the Rochester Area Foundation, will purchase fitness related equipment, and implement a plan for cost effective ways for all members and our community to access the equipment and the events supported by Team R.E.D. Our project increases the visibility of the Community Foundation and the amount of youth and families that will be able to participate in activities within the Byron Community Foundation service area in partnership with several local organizations and groups. The Byron Community Foundation is proud to announce that Grant Money is now available to award! As a part of its effort to strengthen and enhance the City of Byron as well as the surrounding communities, the Byron Community Foundation’s Board of Directors is excited to announce that we have grant money available for early childhood development and entrepreneurship initiatives. Click here for more information and a link to the grant application. The Byron Community Foundation is proud to support All Pro Dads & their work to strengthen the relationship between Dads & their children. Thank you All Pro Dads for helping to make Byron even better! Check out the full story from September 18th at KAALtv.com. The Byron Community Foundation (BCF) will be a part of the Byron Good Neighbor Days Ice Cream Social held on Friday July 18th at 6pm at the Byron City Hall. Stop by to learn more about The BCF, pick up a BCF Grant Application and participate in the Good Neighbor Days activities. Want to learn about the Byron Good Neighbor Days? Click here for the full schedule. The Byron Community Foundation is proud to announce $3100 in grants available to award! As a part of its effort to strengthen & enhance the City of Byron as well as the surrounding communities, the Byron Community Foundation (BCF) is excited to announce that we are offering $3100 in grants. Five $600 grants will be awarded to non-profit organizations, local government units, or public agencies. Additionally, one $100 grant will be awarded specifically for Youth Developement. The BCF Grant Application will be available on our website on Friday July 18th. For more information or questions, please call 877-970-1919 or email info@byroncf.org. The grant deadline is August 15th & the recipients will be announced in September 2014. The BCF will also accept the MN Common Grant Application in lieu of the BCF Grant Application. The creation of a Founders Club is one of several projects the new Byron Community Foundation is rolling out this year. The Founders Club is the first step to raise funds for the foundation's endowment fund, which will enable the foundation to distribute grants to viable projects in and around the City of Byron. Participants invest $1,000 to become a member of the Founders Club.